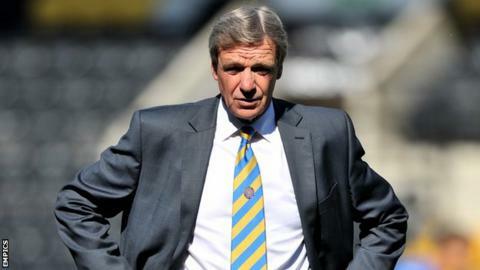 Shrewsbury Town manager Graham Turner has criticised his players for their "inept" performance against Yeovil. Two goals from Paddy Madden and one from James Hayter led the Glovers to a 3-1 victory at Greenhous Meadow. "We've got to be honest and say that was the most inept performance since I've been at the club," Turner told BBC Radio Shropshire. "We didn't work as hard as we have done, and we didn't deserve anything from the game." He continued: "You can't give the opposition an easy goal start like we did. "They looked nice and relaxed after that, growing in confidence, and they let us have it. It was unforgivable." Shrewsbury now find themselves lying in 20th place, one above the League One relegation zone, with only one win in their last seven league games. And Turner believes improvement needs to be made in every area of the pitch for Town to play the standard he expects of his players. "There are obviously problems in the defence," said Turner. "And it was the fewest chances we've created in a game. "We were way below the level we should've been at."